You are really cranking the reviews out over the holidays!!! Keep up the good work! Thanks Rob! Yes I have finally had the time to work on stuff I enjoy, like this website. I appreciate the support brother, all the best. Thanks Zakk! Yes definitely give this a handle if you have them available to you. I think you will like the knife a lot. I am really surprised to hear about your Recon 1! I have handled a lot of tri-ad lock knives and have yet to experience any blade play. Have you tried adjusting the pivot? Might need some lock tite once you get it fully tweaked. Either way I’d be curious to hear what the story is. Thanks for reading and taking the time to write the nice comment. Sorry to hear about your Recon 1. Possibly it would be better to send it to CS for repairs, because it obviously has some defect. The Tri-Ad lock is self-adjusting by design, and I have never seen a knife with that particular type of lock that has an up-down blade play. Yet another great review Dan! I have been raving about the Cold Steel 2011 Voyagers since I got mine a few months ago. They are a definite improvement over the older versions. The handle ergonomics are wonderful — weather laying them into a cut or sharpening or stropping them — it works so well for me! My only question is if they were able to relax the Triad-Ad lock on the XL Tanto-Point versions? I had two of the older XL Tanto-Point models and opening them via thumbtstud was rough. Thank you Greg! I really appreciate the kind words. I agree, this is an extremely comfortable knife. I haven’t been this excited about “value” knives in a while. You know I have not got my hand on the XL Tanto, but my XL Clip point came very smooth and relaxed. I think maybe some of the earlier version of the knife were a little stiffer, but I haven’t had any issues with the two XL Clip Point Voyagers I have used. Thanks for reading man, take care. I’ll have to take the Cold Steel plunge sooner or later…. Great review, as always. Thanks man. This is a solid knife that makes for a great beater. It’s a little thick in the pocket but I carry the medium and large with no problem at all. I have been a CS fan for many years and have many of their knives. Presently, I do not have this particular iteration of the Voyager series. They are one tough knife and I like your label of “value” knife–true. Just found this site and like it. Hey Waykno, Thanks for stopping by man. I think you will really like the new Voyagers – especially if you are already a fan of Cold Steel’s products. They made some very nice upgrades to this version. And yes, I think these are an excellent value. I’m glad you have been enjoying the site – I’ve got a lot of new stuff planned for 2012. Mainly better reviews of cooler knives, but I’m also going to be upgrading this mega slow server and doing some other stuff. Thanks again for dropping in! I kind of took a break for a while so I am way behind on your reviews. I enjoyed this one. I have still be struggling over whether or not to get a voyager since I already have the Recon1. After reading I think I will go ahead and get a Voyager. Now to decide which one…nice review! Hey Richard! Great to see you back man, I was wondering where you went. I would definitely still suggest getting the Voyager, there are still plenty of interesting differences between the two. I look forward hearing what model you decided on and eventually reading your review. I picked the small Voyager and love the knive. However, it takes quite a bit of effort to disengage the lock. You mentioned in your review that this was not an issue for you. Any recommendations? As always, great review! Hmmm, I am not really sure. It’s possible there are differences in tolerances between manufacturing runs, but my Voyagers were all reasonable (whereas the Spartan took 2 hands for me to disengage the lock). Unfortunately my only real suggestion is to just keep working the lock – hopefully it will break in quickly. If it is really bad Cold Steel may be willing to replace it. Thanks for reading! I personally have and carry the XL version. No play, very sharp, love it! Glad you like yours, Cordel. I had a buddy who carried the XL version. Pretty impressive piece of hardware! You know what, I ended up giving all of my Voyagers away after doing this review, but very recently bought another Medium Voyager for my own personal use. I love it. Fantastic knife for the reasons you have described. I am considering writing an article just on the medium Voyager. Went through most of your reviews and been contemplating between the Voyager (Medium) and Kershaw Leek (Black) for EDC. Which one would you recommend? The previous folder that I got as a gift is falling apart (missing screws) and I need cost effective replacement. While the Spyderco PM2 and ZT 0350 are often recommended, they are in a different league and price point. Thanks for stopping by and for the great question. The Voyager is thick and overbuilt. It’s a fun and satisfying knife to play around with and EDC, but I think you will find the Leek to be much more practical if you are looking for a streamlined urban / suburban EDC. A good friend of mine has EDC’d a Leek for several years and he still likes it. Both are very nice for the money. Hi Dan! Wow that was a quick reply. I think I’ll go with the black Leek 1660ckt over the regular stainless just because it might be sturdier with the extra DLC coating and it’s less “flashy”. 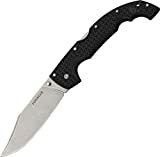 For your reviews on tactical or self-defense knives, is it possible for you to note on the grip/feel when you hold the knife blade up? I believe nobody does that. I leaned towards the Leek over the Voyager (medium) because it might be awkward to hold the knife that way among others. My pleasure. Do you mean the “icepick” grip? I can try to do that. I must confess that I know very little about self defense, so I am always hesitant to offer advice in that arena. I might suggest checking out WeAllJuggleKnives on you tube for more “tactical” commentary. Thanks for the WeAllJuggleKnives recommendation. Will check it out. I’ll keep that in mind, Chester. Thanks and enjoy WAJK’s channel. He has some interesting stuff on there. Dan, this remains one of the most useful reviews of this excellent series of knives. 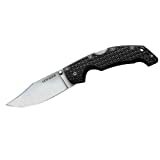 The Large Voyager clip point is perhaps my #1 favorite “edc/tactical crossover” folder under $100. The combination of impressive size, light weight, tough build, excellent slicing performance, and comfortable ethos with well above average ergonomics is very hard to find together in one blade and gives the L Voyager a certain charisma all its own. Fit & finish is also way above expectations. Right now there are some online deals that have the M and L Voyagers for crazy prices like $35 to $40. At that price point, if you don’t mind a somewhat weaponized looking, but good carrying and very functional tool , it is hard to see why anyone would pass up the chance to grab these. Peace! Hey Anon, Thanks for dropping by. Glad you are still enthused about the Voyager series. I agree that the large Voyager is really tough to beat for a larger work knife. They really did a good job with it. Just one more observation: the XL Voyagers are equally well made and are very legit for what they are, but for an actual EDC choice (“car knife” or tool box use is another matter), I ‘d say the target market starts around 6’2″ 225 lbs and goes up from there. Which excludes me! Still fun to own. The Large size is really the sweet spot in my view.